Was a great game to watch . 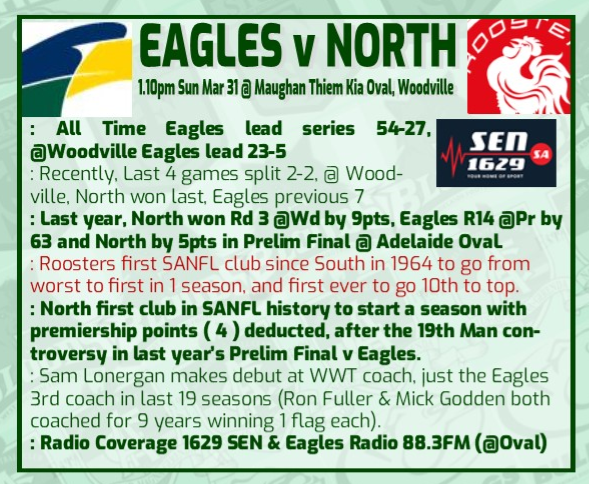 It must be said that it was a courageous 25 point win by the Eagles given they were 2 men down before half time, North will rue their first quarter when their lead could have been 3 or 4 goals had they kicked straight !!!!! Are you saying the Eagles only won with 19 fit players from half time? PhilH wrote: Are you saying the Eagles only won with 19 fit players from half time? And by the fourth Eagles were down three players . Thankfully the eagles didn’t just hold on they kept going forward . Yes it was a spiteful game both levels seconds and league. Sitting in the outer you could clearly here Norths seconds players yelling smash into him , when a lone eagle was taking a mark . Didn’t stop the seconds and the eagles league side stopped going after the former player . However it was a heated game . Forward line perhaps Pickett will get a call up . True but on the boundary line you could clearly hear north’s seconds side screaming out to smash into eagles players going for marks . As was Hayes for the eagles into an ex eagle before his injury and that resulted in north getting a goal . It was a tough game great win but lots of questionable attacks on the body in marking contests by north mainly . Clearly visible from the boundary line and one incident where two north defenders were holding Hayes I think as he leaped umpire was within a metre nothing just play on . I won’t query the umpires but one couldn’t bounce the ball looked to do a hammy and seemed to be on a different rules page to the other umpires . After all that let’s not take away from the Eagles three players off the ground injured still kept attacking and they won . Add in the comic relief when there were two infringements of the new 6-6-6 rule and the umpires didn't know how to proceed. They needed a mid-ground "conference" to decide what to do. Eagles ended up with only 17 on the field. Johansen came off with slight concussion. Schmusch - Possible # sternum to be further investigated today. Nick Hayes - Badly dislocated index finger, bone poked through skin. Operated on, reset, five stitches. Giuffreda - late withdrawal Friday night. whybother wrote: Add in the comic relief when there were two infringements of the new 6-6-6 rule and the umpires didn't know how to proceed. They needed a mid-ground "conference" to decide what to do. I wasn’t the only one confused watching AFL games teams get a warning . But not in the SANFL north got two frees in front of the goals . I don't understand why they were 50m penalties as well. I went to the digital to see what happened but only last 1/4 on there. I sit in the cricket club and you don't hear what is being said at ground level. Were they 666 decisions as I thought a warning was required. goddy11 wrote: I don't understand why they were 50m penalties as well. I went to the digital to see what happened but only last 1/4 on there. I sit in the cricket club and you don't hear what is being said at ground level. Were they 666 decisions as I thought a warning was required. Whatever happened neither sides fans knew what was going on . Surprisingly there were nice north fans there. Wasn't claiming him to be a match injury "bayman" but just advising he was a late withdrawal for those who were unaware.